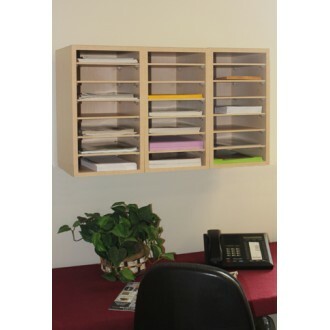 Economy, Wood sorter/Organizer with 21 pockets, keeps your faxes, progress reports and computer printouts organized and at your fingertips. A great addition to any mail room, office, school or warehouse area. All pockets adjust in 1" increments. Each shelf is 9" wide x 12" deep. Available in Black and Light Maple. 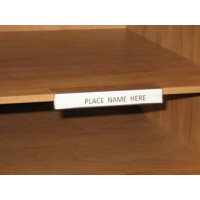 To label your shelves use Model L14. 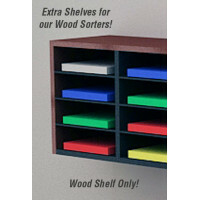 IMPORTANT: This wood sorter shown Wall Mounted but can be set on table top. Special drilling is required for wall mounting (wall mounting hardware not included). • Heavy duty wood laminate sorter/organizer. • Each opening is 9"W x 2"H (adjustable height) x 12-1/4"D.
• Special drilling is required for wall mounting (wall mounting hardware not included).